All electric devices are built to operate with a certain type and amount of electrical energy, but this is often not the same type or amount of electrical energy that comes out of the outlet in your wall. Power converters modify electrical energy to a useable current, voltage, and frequency for an electronic device. Today's power converters are large and inefficient because they are based on decades-old technologies and rely on expensive, bulky, and failure-prone components. Within the next 20 years, 80% of the electricity used in the U.S. will flow through these devices, so there is a critical need to improve their size and efficiency. Massachusetts Institute of Technology (MIT) is teaming with Georgia Institute of Technology, Dartmouth College, and the University of Pennsylvania to create more efficient power circuits for energy-efficient light-emitting diodes (LEDs) through advances in 3 related areas. First, the team is using semiconductors made of high-performing gallium nitride grown on a low-cost silicon base (GaN-on-Si). These GaN-on-Si semiconductors conduct electricity more efficiently than traditional silicon semiconductors. Second, the team is developing new magnetic materials and structures to reduce the size and increase the efficiency of an important LED power component, the inductor. This advancement is important because magnetics are the largest and most expensive part of a circuit. Finally, the team is creating an entirely new circuit design to optimize the performance of the new semiconductors and magnetic devices it is using. If successful, MIT's new LED power circuits would increase the efficiency and decrease the cost of energy-efficient LED lights, helping to facilitate their widespread use. This project would drive adoption of energy-efficient lighting, in turn reducing pollution and harmful emissions. This project could cut the cost of an LED circuit by 50%--reducing the cost of energy-efficient lighting for consumers. 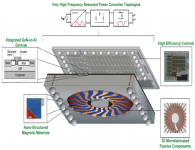 The MIT team developed a power converter that reduces both cost and power loss. The circuit concept designs they created and the lessons learned during the ARPA-E project directly informed the design of a 65 W laptop charger that is three times smaller and lighter than conventional chargers. The spinoff company that developed the charger, FINsix, partnered with Lenovo to make smaller chargers available for select ThinkPad models. Concurrently, the team is collaborating with major power electronics companies such as Texas Instruments to design converters in the range of tens to hundreds of Watts. LED drivers are a second initial market. The novel gallium nitride (GaN) transistor technology MIT developed under its ARPA-E project served as the key intellectual property (IP) to start the company Cambridge Electronics. Started by students whose work was originally funded by the ARPA-E project, Cambridge licensed the IP from MIT and is currently offering state-of-the-art GaN devices for sale to selected partners. The team addressed three areas needed to improve power conversion in developing their converter: switching devices, inductors, and circuit design. The project team sought to exploit the potential of GaN for high-power switching in practical, reliable devices, to create high-frequency inductors by developing new materials and designs, and to create overall circuit designs for power converters that optimally integrated new components. First, the team made enhancement mode GaN high-electron-mobility transistors (HEMT) capable of withstanding 600 V. Second, the team increased the power density of the converters by creating inductive elements capable of switching at 5 MHz, thereby shrinking their size. Partner Georgia Tech created solenoid and toroid inductors with and without magnetic cores, while drastically reducing the fabrication time and cost. In parallel, the team developed magnetic core materials to achieve a higher efficiency and inductance with fewer inductor turns. MIT also developed new circuit topologies to take advantage of the enhancement-mode GaN HEMTs and the high frequency inductors. Ultimately, the team’s research and work has significantly advanced knowledge and development of power converters. For a detailed assessment of the MIT team's project and impact, please click here.